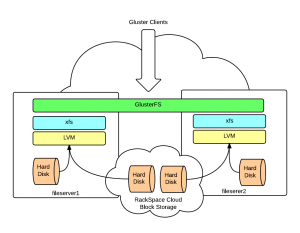 We want to build a high-availability storage cluster based on GlusterFS using RackSpace Cloud Servers on CentOS. Also we want to use RackSpace Cloud Networks to provide private networks for replication and cluster access. Finally we want to use RackSpace Cloud Block Storage with LVM and XFS to simplify future expansion. As shown in the diagram, we’ll have two Cloud Networks, one for replication between the servers and one for access by clients to the storage. 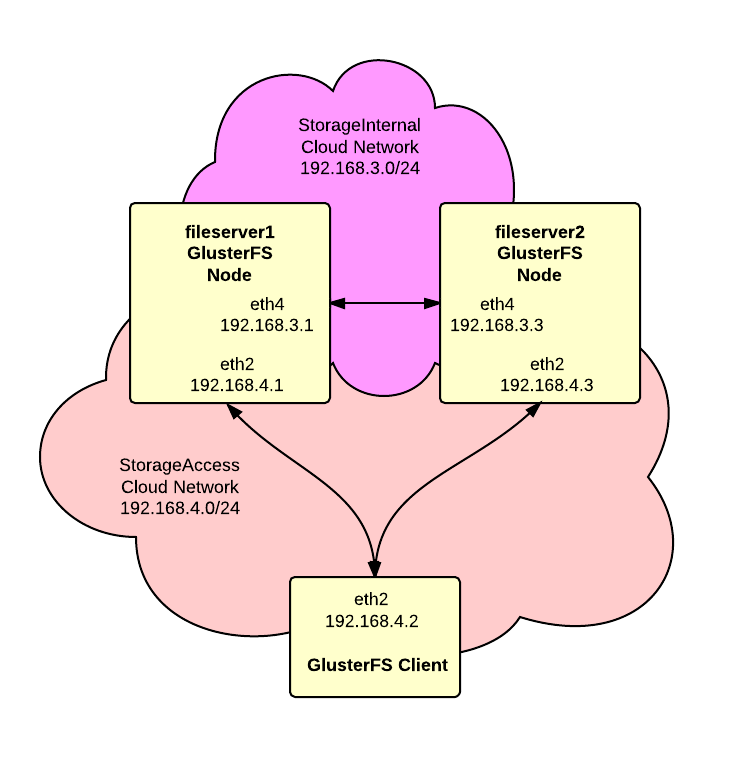 The next diagrams shows the filesystem layers – local, CBS, LVM, XFS and finally GlusterFS. Make sure you choose a Next Gen region for the servers. Select a size based on your requirements. We’re using 1GB for this article. In the Networks section, when creating the first server, click the “Create Network” button and add a network named “StorageInternal”. Then create a second network named “StorageAccess” When creating additional servers, make sure that you select the “StorageInternal” and “StorageAccess” networks. In the Advanced Options section under Disk Partition choose the “Manual” option so that we can partition and format the hard drive to our preferences. 2. Open SSH shell to servers – Open an SSH shell to each of the servers. Unless noted otherwise the following steps should be repeated on both servers. 4. Setup /etc/hosts – Add hostnames on the “StorageInternal” network for each server. 5. Partition primary storage – Since we chose the “Manual” disk partition option, a 20GB root partition was created and the remainder of the primary storage was left unpartitioned. We need to partition this storage in preparation for later use in our LVM array. Since we changed the partition table on the root device a reboot is required to make the new partition visible. Continue once the reboot has been completed. 6. Add Cloud Block Storage – For this example, we need about 250GB of usable storage. There partition we just created has 20GB so we need to add about 225GB more using Cloud Block Storage. a. Login to the cloud management console and drill down to the first server. Scroll down to the bottom of the page and click “Create Volume” in the “Storage Volumes” section. b. Complete the Create Volume form. I like to include the hostname in the volume name along with an iterator so I used “fileserver1-1”. Set Type to “Standard” unless you need high performance and can afford the premium SSD dcrive. Enter the size which is 230GB for this example. Click “Create Volume” button to complete. c. Click the “Attach Volume” button, select the volume and click the “Attach Volume” button. d. Wait a few minutes for the storage to attach to the server. So you can see that the new volume has been attached to the “xvdb” device. Your device name may be different. Building a new DOS disklabel with disk identifier 0xbb11777b. Repeat this process for the second server. We’re going to use LVM to combine these two physical partitions into a single logical partition. Repeat this step on both servers. This rule allows all traffic on eth4 which is the “StorageInternal” network. Creation of volume datavol has been successful. The howto by Falko Timme mentioned at the start of this article gives some useful advice and tips on how to troubleshoot if the volume fails to create or start. Setup on the server is complete. Now it’s time to add clients. We’ll assume that the first client is also going to be CentOS. Notice that we’re mapping both the StorageInternal and StorageAccess network names to the same IP addreses on the StorageAccess network. And that completes the client setup procedure. 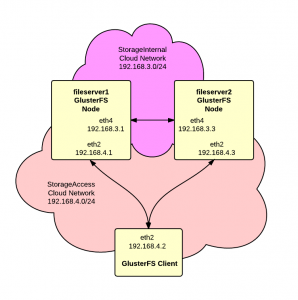 You now have a working GlusterFS storage cluster and a connected client. 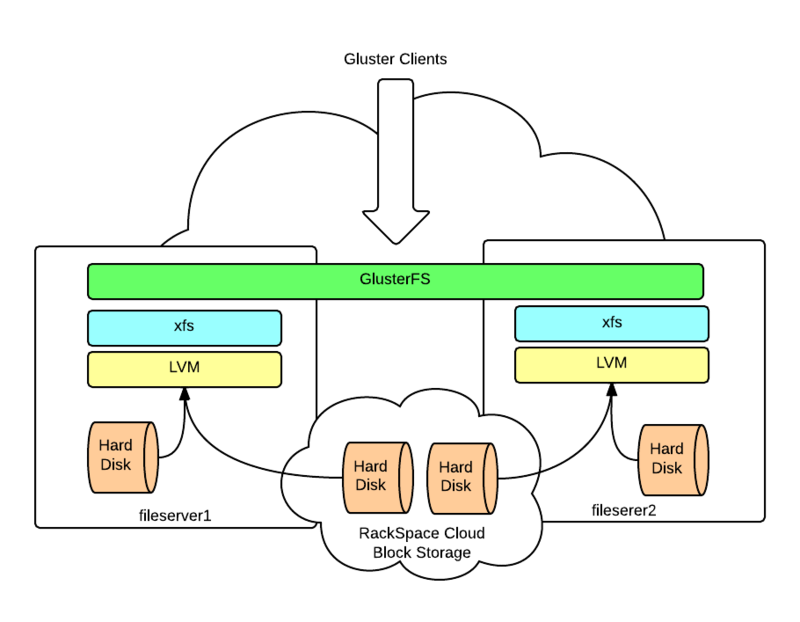 We want to build a high-availability storage cluster based on GlusterFS using RackSpace Cloud Servers on Ubuntu. Additionally we want to use RackSpace Cloud Networks to provide private networks for replication and cluster access. We’re going to follow this doc with a few modifications for Cloud Networks and using a newer version of Gluster. If you need more storage then is included in the base image or if you want higher performance the consider using RackSpace Cloud Block Storage. This is not covered in this article. /usr/local/psa/bin/dns --add acme.com -mx '' -mailexchanger ASPMX.L.GOOGLE.com -priority 10 /usr/local/psa/bin/dns --add acme.com -mx '' -mailexchanger ALT1.ASPMX.L.GOOGLE.com -priority 20 /usr/local/psa/bin/dns --add acme.com -mx '' -mailexchanger ALT2.ASPMX.L.GOOGLE.com -priority 20 /usr/local/psa/bin/dns --add acme.com -mx '' -mailexchanger ASPMX2.GOOGLEMAIL.com. -priority 30 /usr/local/psa/bin/dns --add acme.com -mx '' -mailexchanger ASPMX3.GOOGLEMAIL.com. -priority 30 /usr/local/psa/bin/dns --add acme.com -cname 'mail' -canonical ghs.google.com. /usr/local/psa/bin/dns --add acme.com -cname 'mail' -canonical ghs.google.com. This should make it much easier to do bulk DNS operations in the cloud.